The recent changes in the exam system have required students and teachers to make some significant adjustments. With the first 9-1 exams over, now is a good time to reflect on the areas that students have found particularly challenging. One of these is the need for students to apply their knowledge to unfamiliar contexts. We need to encourage our students to have a go at questions. For many years, students have had a bitesize approach to their learning, with modular exams awarding top grades to candidates who had excellent memory of the key facts. Now, for the new specifications, students are expected to learn the facts but also, and more importantly, to be able to apply them to novel situations. In my experience, this has led to cries of ‘you didn’t teach me that’ and ‘it wasn’t in the revision guide’. So, how can we build the confidence of our students, so that they have faith in their abilities and can put their best guess forward, which will often gain them recognition in their exams? 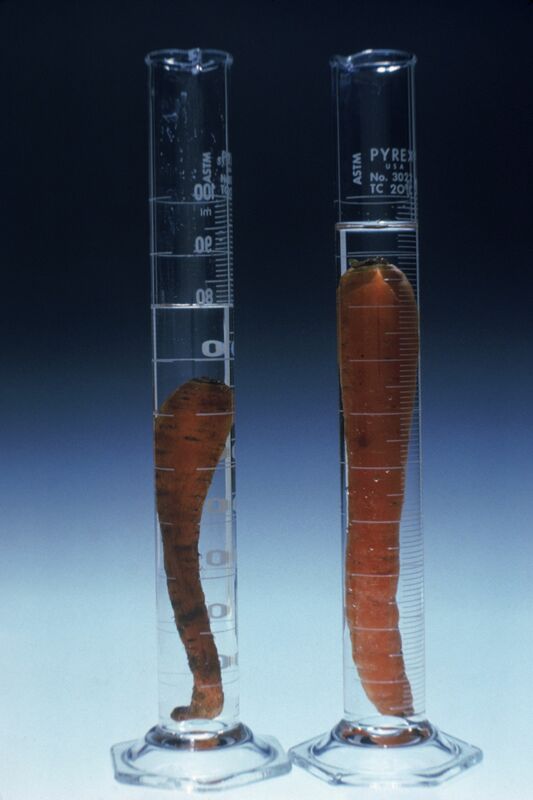 Students taking the Higher Tier AQA Science 2018 exams were asked to apply their knowledge of osmosis to novel situations, such as carrots. The importance of applying knowledge and how this can differentiate between students of different abilities was illustrated by the ways in which the Summer 2018 Science AQA GCSE papers approached osmosis. Foundation Trilogy looked at osmosis in potatoes, whereas the higher tier asked students to consider carrots, and the Biology higher tier paper used eggs to illustrate osmosis. This confused many students! Remember, these exam questions draw on the knowledge and understanding students have gained by carrying out the practical activities and count for at least 15% of the overall marks for the qualification. Many of these questions will focus on investigative skills and how well students can apply them to practical situations, often in novel contexts. Trilogy Required Practical 2 and Biology Required Practical 3 are both the same investigation into osmosis. Candidates experiment to see how the mass of plant tissue is affected by altering the concentrations of salt or sugar solutions. The classic experiment involves five potato chips, ideally from the same tuber and measuring the starting mass. Each chip is then placed in a solution of different concentration of salt or sugar, with a control placed in distilled water. The potato is left in the solution for more than half an hour, removed, patted dry and then mass re-measured. This activity can be extended by students considering how the dimensions of the potato can also change. AQA provide suggested practical booklets and Kerboodle includes differentiated student worksheets and full teacher and technician notes to support all of the Required Practicals. There are also many high quality video clips on YouTube, such as those from Malmesbury Science. In my experience, the osmosis practical is almost always completed with potatoes (they are cheap and plentiful) and with salt or sugar (very safe). Hence why this was probably chosen for the foundation students. But higher tier candidates were expected to be able to apply this knowledge about potatoes. 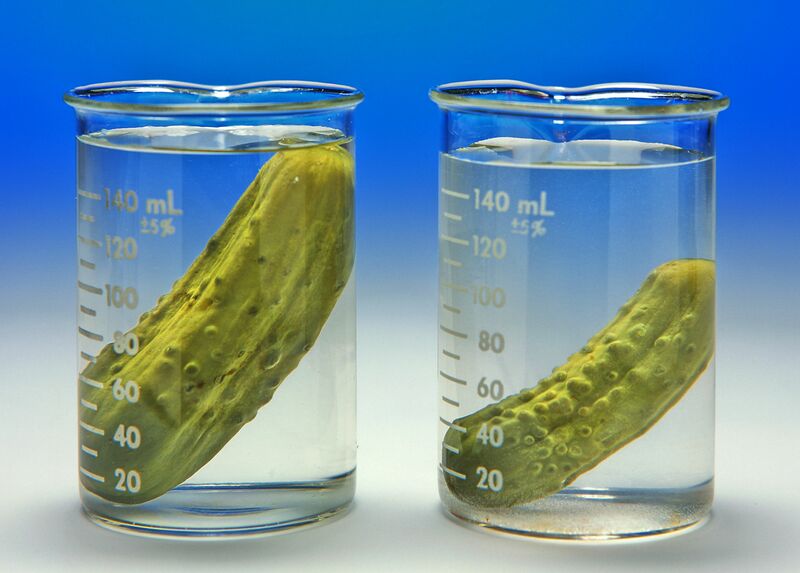 Cucumbers can be used to show osmosis too. As a starter to the lesson, put one cucumber in distilled water and another in brine. Ask students to suggest what will happen to the mass and dimensions and why. As a plenary, come back to the experiment and discuss the outcome. Even though we teach diffusion, osmosis and active transport and illustrate this with particular examples, we need to help students make the connection between the practicals and the theory and then help them apply this to unfamiliar and novel situations. One method for doing this would be to give an exam question with an answer. Then give exactly the same exam question but change the context, e.g. potato to cucumber. Students then use the exemplar answer to generate their own. Another is to complete the Required Practical and then give follow-up exam-style questions where students apply their knowledge gained from the practical to new situations. Kerboodle worksheets have a follow-up section which is ideal for this. A more radical approach would be to use flipped learning. Ask students to watch a video of the traditional Required Practical and read up in the course textbook. Then in class they complete the required practical on a novel situation, such as investigating osmosis in eggs. Sam Holyman is Second in Science at Aylesford School in Warwick, and formerly West Midlands ASE President. She is also author of a number of best-selling science textbooks for KS3 and GCSE, and a keen advocate of innovative teaching and learning. She was nominated in the Teacher Scientist category for the Science Council’s 100 leading practicing scientists, a Charted Science Teacher and has recently been awarded a CPD Quality mark. New Required Practical Exam Practice Workbooks, written by Primrose Kitten, are coming soon. They offer targeted practice specifically for the Required Practicals and help students to translate their skills from familiar to unfamiliar contexts. Find out more.